Continuing with theme of the previous tutorials, let’s investigate data triggers work. 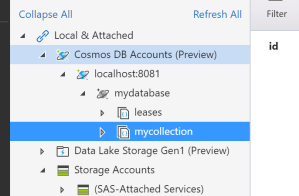 There are three possibilities: Blob, Queue, and Cosmos DB (maybe there are more but these are a good starting point). For some reason Azure Tables are not supported, and there is an open issue for this support since 2015, so I don’t think it’s coming soon :-). For this tutorial I created a new Azure Functions project and three functions based on the templates provided by the VSCode Azure Functions extensions, which is a good place to start the investigation. 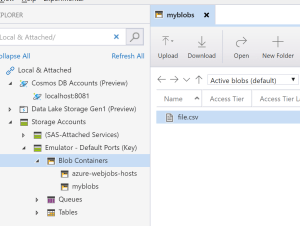 For this tutorial you’ll need the Azure Storage Emulator up and running, and the Azure Storage Explorer open so you can make changes that trigger the functions. 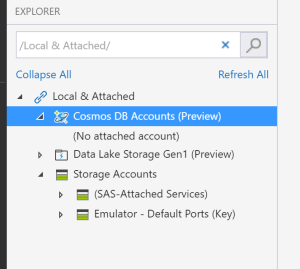 You also need to have an Azure Cosmos DB Emulator installed and running – you can download it from here and follow the installation instructions. But what happens if the function is not working and there are changes to the blobl? Well, that’s what we are here for, to investigate :-). Let’s stop the Function with Shift-F5, add a couple of files to the Blob, and start the function again. The function detects the changes and each changes triggers it. 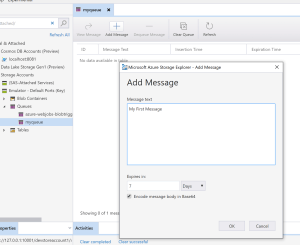 Messages processed by the function are removed from the queue after being processed, and if there are messages added to the queue when the function is not running, when the function starts each one of these messages triggers the function. It’s important to note that these message processing is done in parallel – the runtime will process up to 24 messages in parallel on each machine that hosts the function (based on this documentation). So don’t assume any serial order on messages received. There are other interesting things to know about how queue polling works and what happens when a message can’t be processed. Creating each item is very simple and done through right-clicks on each node so I’m not going to show the exact steps… I trust you can figure it out. We now know how to use a couple of triggers based on data. 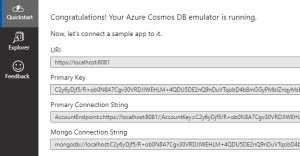 In the next tutorial we’ll investigate how some of the Function bindings work, in preparation for our first “real” application using Azure Functions. Until then, happy coding!